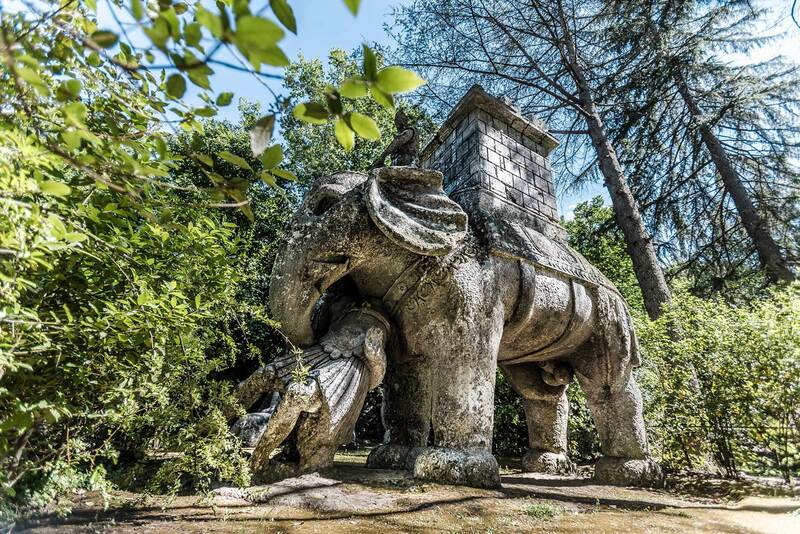 Known sometimes as the “Monster Park”, the “Garden” and the “Sacred Wood” are the two parts that make up the Bomarzo complex famous for its hermetic significance and fantastic statues. The Sacred Wood was built in the middle of the 1500s by Vicino Orsini who gained his inspiration from works written by Giulio Camillo, known as Delminio, for the King of France, Francesco I. The object of the garden complex was to represent the synthesis of Greek, Hebrew and Christian culture. The park is structured on four levels that narrow into a peak like a pyramid as the levels rise. The itinerary to reach the peak where the temple is located is dotted with sculptures made of peperino rocks that were present on the land. The temple symbolizes the alliance between the Farnese and Orsini families and was built in homage to Giulia Farnese, wife of Vicino Orsini. Among the sculptures the best known are the leaning house which reminds us of the difficult condition of the group of “Spiritualists”, the Tartar Mouth, the Graces, the elephant, a symbol of false religions which also honors Vicino’s son Orazio Orsini who died in the Battle of Lepanto and the theatre, the only signed and dated work. Discover the Tuscia with Archeoares.